Rarely do movies show potential viewers as much consideration as Henry Dunham’s The Standoff at Sparrow Creek does through title alone. Everything a viewer needs to know about the plot, the story, and the setting is baked right in the name in just five words: There’s a creek, there’s a standoff happening by the creek, and the creek somehow relates to passerine birds. For a percentage of folks, that’s all the info they’ll need to purchase a ticket. The details left out of the title are small potatoes compared to the basic structure outlined by the film’s self-summarizing appellation, not just to a prospective audience but to Dunham himself. The Standoff at Sparrow Creek is as stripped down as thrillers get: An ex-cop turned militiaman meets up with his fellow militiamen after hearing of a shooting at a police funeral ostensibly perpetrated by one of their number. Packed into one confined space, each grows suspicious of the others and increasingly keen on saving their own asses. The ex-cop is Gannon, played by James Badge Dale. Gannon’s peers—Noah, Beckmann, Morris, Keating, Hubbel and Ford—are played, respectively, by Brian Geraghty, Patrick Fischler, Happy Anderson, Robert Aramayo, Gene Jones and Chris Mulkey, a burly assemblage of men ranging between chiseled and slovenly. Once gathered, they don’t leave the warehouse they use as militia HQ, remaining under its fleeting protection as Gannon employs the interrogation skills he picked up in his days working for the law in a controlled but obviously unnerved attempt at finding the cop killer in their ranks. Resist the temptation to compare The Standoff at Sparrow Creek to Reservoir Dogs, or even The Hateful Eight—one-room movies populated by characters severely lacking trust in one another. Dunham doesn’t exhibit Tarantino’s flair for colorful, punchy dialogue and pop culture referentialism but nor should he, necessarily—this is a film anchored to here and now, unfolding so briskly that borrowing Tarantino’s elements of style would rob the experience of immediacy. Desperation is oxygen to The Standoff at Sparrow Creek, not snappy, cuss-laden banter. It’s easy to roll eyes at them when they’re not occupying the screen and laying out their terrifying ideologies, of course, but Dunham keeps enough distance from the basic conceit that his material metastasizes into a functioning narrative instead of aggressive commentary on American extremists. The people here are genuine people driven by grudges formed out of personal tragedy or social isolation. Taking on the role of negotiator, Gannon accidentally winds up playing the part of therapist, too, hearing out his peers’ motivations and histories as he goes about the business of unveiling the culprit. The film’s a showcase for Dale, one of those “I know that guy!” actors who pops up in random parts in random movies and who most likely know by face more than by name. The Standoff at Sparrow Creek demonstrates his remarkable dexterity as a leading man who can hold the center of a film while making everyone else around him look good. Dunham’s assembled a talented bunch overall—especially Jones and Fischler—but Dale’s hard-nosed macho posturing forces all of them to step to his level. 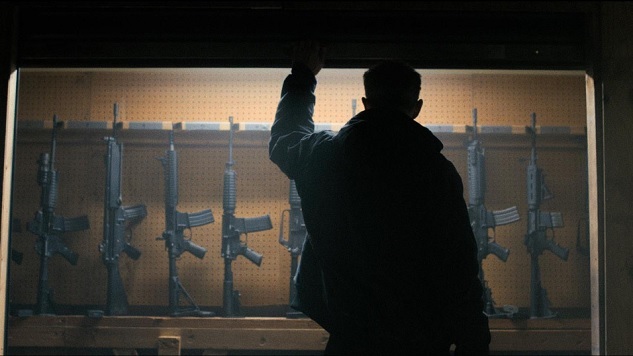 Just as key to The Standoff at Sparrow Creek’s sustained tension is Dunham, who, knowing he’s set a challenge for himself by relegating the action to a single location, finds ways to avoid the potential narrative suffocation of proximity. He shoots from a distance when violence must be recollected or performed, and he knows just how close to get to his subjects when they’re trading alpha male bluster. The movie’s masculine energy is off the charts. Everyone metaphorically paws the ground in every verbal altercation, ready to charge at his cohorts with the slightest provocation. But Dunham’s filmmaking remains disciplined throughout, building pressure within that’s eventually released in explosive violence. That’s what the title promises, after all. But that promise doesn’t blunt the jolting effect of The Standoff at Sparrow Creek’s storytelling or the gutpunches dealt in its climax.